“no corroboration” are no longer acceptable arguments. incident details to authorities, law enforcement, or your attorney. Let technology be your witness. Introducing Incident Genie™, a FREE APP FOR EVERYONE that records the time and place of any incident you need to record. 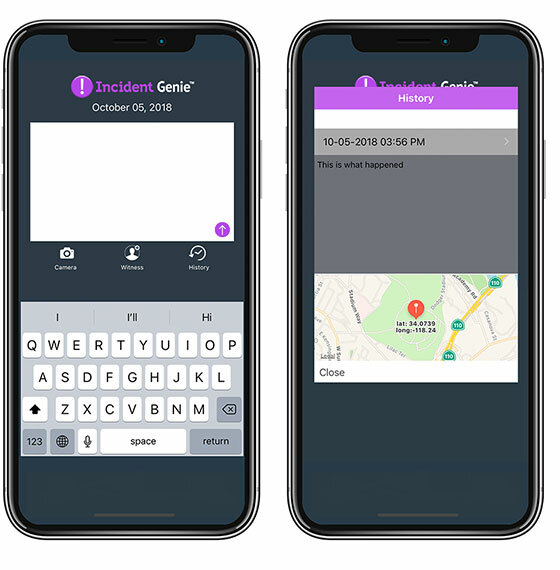 With the push of a button, Incident Genie™ safely stores the GPS data, date, and time of an incident on your phone and supported cloud services. You can easily include photos, videos, and witnesses for any incident. 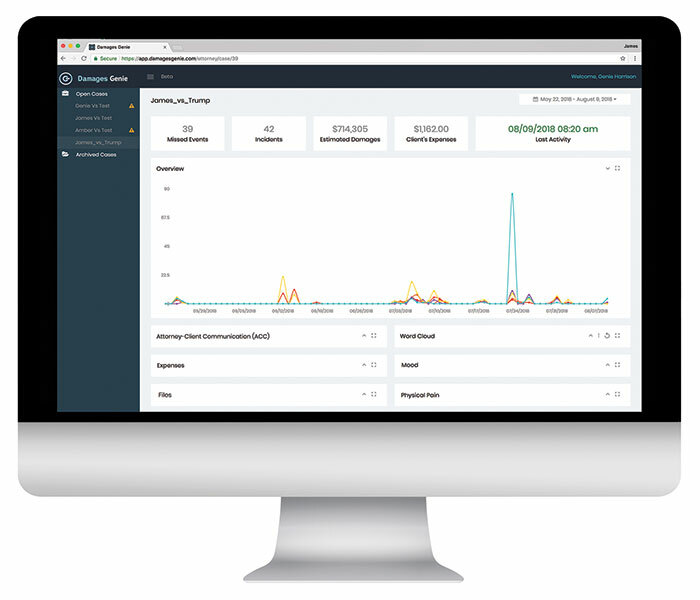 Incident Genie™ allows you to recall and report incident or accident details to authorities, law enforcement, insurance companies, or your attorney. Be prepared! Download the free app today and let technology be your witness. FREE at the Apple App Store and coming soon to Android. Damages Genie™ mobile app and software for attorneys. to help plaintiff’s attorneys achieve maximum justice for their clients. Your clients suffer every day. Are you recovering their full general damages? 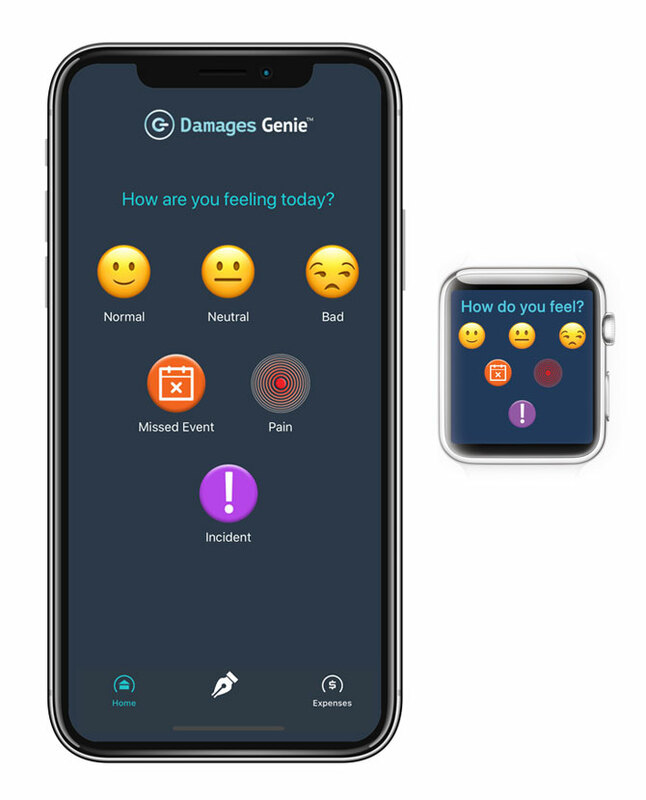 Damages Genie™ is an innovative communication tool for plaintiff’s attorneys and their clients that uses state-of-the art technology to capture, value, and present non-economic damages in all types of personal injury, sexual abuse, and employment litigation. For clients, the app is a direct portal for client-attorney communication about mood, pain, emotional distress, events, and other human damages. Accessible from any web browser, attorneys can instantly view data in the Attorney Dashboard. Data can be evaluated, annotated, and valued. Data and reports can be exported in a variety of formats, including word files, Excel files, and PDFs, and presented demonstratively with built-in charts and graphs. Available for participating attorneys for Apple iPhone and Android Smartphones. Read about what the press is saying about Damages Genie.